Important: At the bottom of this section is the audio instructions for the program. Please listen to the audio instruction after you download the program. Scroll down to get to the audio instructions. This program is for PC's. 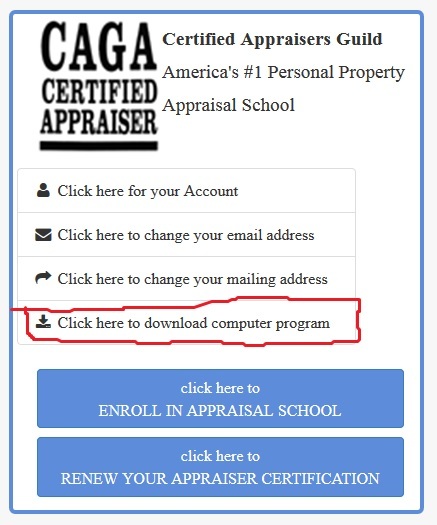 To unlock your appraisal computer program you will need a download. You must be connected to the internet to complete the download of the program. Please follow the directions below to do a download. To download or upgrade the appraisal report computer program (and your passcode to unlock the program) click on the link below. Click Here to download the program or to receive your Upgrade to the computer program. The first time you will need to create a member account. After the first time, you will simply need to login. This will allow you to manage your membership account including downloading the full program or an upgrade to the program, receiving passcodes, and making changes to your information on our web site's 'Apprasier Search'. Please follow the directions below to receive your upgrade. 1. The login is on the Missouri Auction School web site. Click the button 'click here to download computer program' on the right. 2. Click the 'Create Account' button the first time you login. 3. This is the section for your information. 4. Fill in your information that is requested. Then click 'Continue'. 5. THEN CHECK YOUR EMAIL: You will receive a confirmation email to verify your member account. At the end of the email message there is A LINK YOU MUST CLICK to verify your member account. 6. Click the 'Download Appraisal Navigator Install' button. You can update your information in the section below. If you are a first time user of the appraisal computer program please listen now to the audio instructions below. To listen to an instructional audio that will walk you through creating a sample appraisal report, click the Play button to listen. (the black triangle arrow Play button to the left of the '00:00') below. Please follow the below directions exactly. You can back up to a USB thumb drive. You do not need to use a floppy disk. 2. click start button at bottom left. 3. Click on 'Computer' on list on right of start pop up screen. 4. Look and see what letter is assigned to the usb stick. 5. Make sure the Appraisal Navigator computer program is CLOSED. Do not open the Appraisal Navigator computer program. We have verified your account for you. 2. You are ready to download. Click the 'Your Account' button is on the left under the 'Welcome: ' and the 'Logout' button. 3. Click the 'Installation Instructions' button near the bottom. Then follow the directions provided.